2012 Queens Diamond Jubilee - Miniature Medals and full sized Ribbon now in stock. • Serving members of the Royal Household. 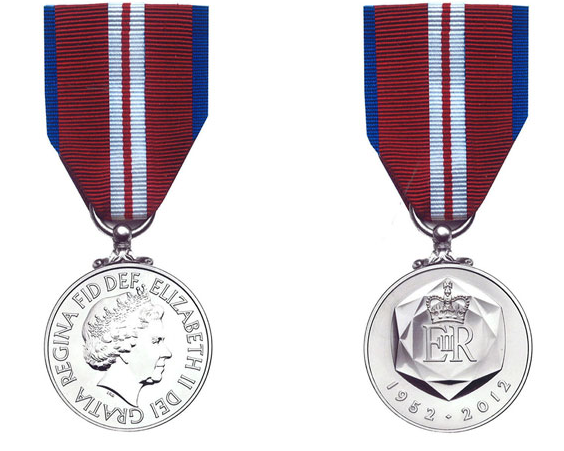 The medal designed by Timothy Noad depicts a formal image of the Queen on one side, while the reverse shows a hexagon with a crown and royal cipher, inscribed '1952 to 2012', commemorating Her Majesty's reign, and finished off with a red ribbon and white/blue stripes. At Medway Medals we pride ourselves on delivering good old fashioned service to our customers. Our shop at 94 Canterbury Street, Gillingham Kent (ME7 5UF) has been serving the military and locals since 1992.